To his friends, Seymour Langer was one of the brightest kids to emerge from Chicago’s Depression-era Jewish West Side. To his family, he was a driven and dedicated physician, a devoted father and husband. But to his youngest son, Langer was also an enigma: a somewhat distant figure to whom he could never quite measure up; a worldly man who never left the city of Chicago during the last third of his life; a would-be author who spoke for years of writing a history of the Bonus March of 1932, when 20,000 World War I veterans descended on the nation’s capitol to demand compensation. Using this dramatic but overlooked event in U.S. history as a way into understanding a father-son relationship, Adam Langer sets out to uncover why the Bonus March intrigued his father, whose own personal history always seemed to be artfully obscured by a mix of evasiveness and exaggeration. 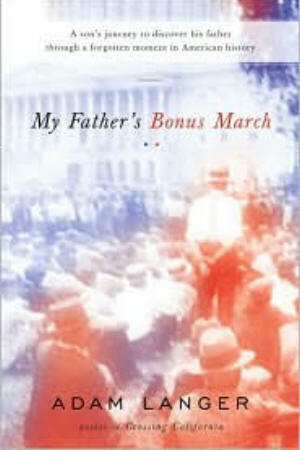 Langer interweaves the history of the Bonus March and interviews with such individuals as Bonus March aficionado Senator John Kerry, and the influential writer and critic Norman Podhoretz, with his own reminiscences and those of his father’s relatives, colleagues, and contemporaries. In the process, he explores the nature of memory while creating a moving, multi-layered portrait of both his father and his father’s generation. — Rich Cohen, author of Sweet and Low, Tough Jews, and Israel Is Real.